Last rallying call: Former Pakistan prime minister Benazir Bhutto gets ready to address her supporters at her last public rally in Rawalpindi. She was killed minutes after she drove away, aides said. Islamabad: Pakistani opposition leader Benazir Bhutto, a two-time former prime minister, had just addressed a campaign rally for next month’s parliamentary elections at Rawalpindi when a suicide bomber blew himself up outside the venue, killing her and at least 10 other people on Thursday. There were unconfirmed reports that the attacker had also opened fire on her. But Bhutto , knew very well the risks she ran when she decided to wage a public campaign for the restoration of democracy. Hours after she returned in October after eight years of self-imposed exile, a suicide bomber killed 139 people in an attack targeting her motorcade in the streets of Karachi. The attack followed threats by militants linked to Al Qaeda, angered by Bhutto’s support for Washington’s war on terrorism. “They might try to assassinate me," Bhutto had told the pan-Arab Asharq al-Awsat newspaper in an interview before she set out to return to Pakistan. “I have prepared my family and my loved ones for any possibility." Despite being in the wilderness for most of the past decade, the tall, stately Bhutto remained one of the most recognisable female politicians in the world. In 1986, a vast sea of supporters had welcomed her home as she came back to challenge a military dictator who had executed her father, deposed prime minister Zulfikar Ali Bhutto, seven years earlier. 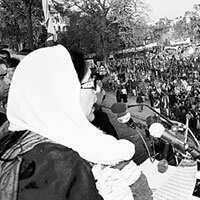 Bhutto became the first female prime minister in the Muslim world when she was elected in 1988 at the age of 35. She was deposed in 1990, re-elected in 1993, and ousted again in 1996 amid charges of graft and mismanagement. She said the charges were politically motivated but in 1999 chose to stay in exile rather than face them. After more years spent abroad, Bhutto, 54, flew back again in October to lead her Pakistan People’s Party (PPP) into national elections. This time, though, rather than confronting a military ruler, she was hoping to work with army chief and president Pervez Musharraf for a peaceful transition to civilian rule. Western allies saw their cooperation as the best way to sustain the nuclear-armed country’s efforts against terrorism. Even when, under worldwide pressure, Musharraf resigned from the military in late November, Bhutto and rival party politician Nawaz Sharif continued to keep him at arm’s length, warning of attempts to rig the coming polls. Bhutto’s family is no stranger to violence. Both her brothers died in mysterious circumstances and intelligence reports have said Al Qaeda, the Taliban and Pakistani jihadi groups have sent suicide bombers after her. Bhutto had said that if she were in power she would allow the US forces to hit Al Qaeda targets in Pakistani territory, if Pakistan’s own forces were unable to carry out an attack. Bhutto, whose first name means “unique", was born in 1953 into a wealthy landowning family. The first of four children, she was educated at a Christian mission school in Karachi, and then at Harvard and Oxford universities. The daughter of Pakistan’s first popularly elected leader, her mission began in 1977 when army chief Mohammad Zia-ul-Haq overthrew him. Twenty-one months later it became a blood feud when Zulfikar was hanged. For years Bhutto fought against Zia without success. She and her mother, Nusrat, were in and out of prison until she was allowed to go abroad for medical treatment in 1984. In August 1988, Zia was killed in an air crash. Bhutto’s election victory later that year was welcomed worldwide as the advent of democracy. But many in the powerful security services distrusted her, and president Ghulam Ishaq Khan sacked her after 20 months, accusing her of presiding over large-scale corruption. She accused the establishment of rigging elections three months later to bring their protege, Nawaz Sharif, to power. Bhutto clawed her way back in 1993 but was again kicked out of power on charges of corruption and misrule. Asif Ali Zardari, the businessman she wed in 1987, was seen as her greatest liability. He was released on bail after eight years in prison in 2004. The deal under which Bhutto returned home in October also erased charges against him. US President George W. Bush, Indian Prime Minister Manmohan Singh among others condemned the assassination and called on the authorities to ensure stability in Pakistan.